Nodens is the original form of the Welsh name Nudd, which later become Lludd in the medieval Welsh legends. His name means 'catcher' and so may be related to hunting or fishing. 'Mist' has also been offered as a meaning for Nudd. He is Lord of Waters, the God of rulership, of the law and was equated with Mars during the Romano-British period. There is a temple to Nodens at Lydney on the banks of the River Severn. ​People have been on this island before it was an island, when it was a peninsula. They knew of the gods that formed the landscape they lived on, they knew their names and gave them masks of a sort to clothe themselves in. The masks were passed on from generation to generation, the gods who wore them changed with the people and the landscape. ​Lludd Llaw Eraint appears in the 12th to 13th century literature as a 1st century, legendary King of Britain, son of Beli Mawr and brother of Llefelys. His kingdom was suffering three plagues; a race of otherworldly beings, two warring dragons and a giant raiding the kingdom’s store of food. He enlists his wiser brother’s help and together they bring an end to all three plagues and restore the kingdom. Beyond this, it is difficult to get a hold on what this legend retains from the preceding centuries. We know that Lludd is a derivative from Nudd by means of mutation to alliterate with ‘Llaw Eraint’ (‘of the Silver hand’) which is a clear connection to Nuadha of Ireland with his silver hand. Whether the silver hand is an original feature of the Brythonic mythos or something that was brought over with Irish peoples in the centuries following the end of the Romano-British period is debatable. There is also a case for the mutation to Lludd being caused by, or being the cause of conflation between Lludd/Nudd and Lir or Llyr. What this legend shows us is that the actions of the clever and somewhat tricksy brother Llefelys are much like the interactions of Nuadha and Lugh in the Battle of Mag Tuired. As such, Lugos (himself a middle Welsh derivation from Lleu and ultimately Lugos) was viewed as the brother of Nodens. What we can extract from the tale of Lludd, is that he was what we could call a ‘good king’; he rebuilt city walls, was generous with his money and looked after the people. Within Dumezil’s First Function roles, this paints him as the Lawgiver King. His brother Llefelys, who also falls within the First Function, fits more into the role of Magician. This role of Llefelys-Lugos slots more neatly into place when you consider the raven associations and his North-European cultural equivalent of Odin; another magician ruler. In modern Welsh, Nudd means ‘fog’ or ‘mist’, and aside from him being the father of the underworld ruler and chthonic god Gwyn, we know very little about Nudd save for the fact his name derives ultimately from Nodens; ‘catcher’. He is reduced to a stepping stone from the more Medieval Lludd, and what we can glean from him and his relationships, to the older Nodens. Before we step further back to Nodens and who he had become, mention also must be made of Teyrnon Twrf Lliant ‘Lord of the Roaring Wave/Sea’. Regardless of whether his epithet means wave or sea, he has definite associations with the seas and as ruler of Gwent in the far southeast of Wales it places him in the neighbourhood of Lydney, the shrine to Nodens. Notably, it is in the adjacent River Severn that the phenomenon known as the ‘Severn Bore‘ occurs; a periodic large wave that runs upstream tens of miles. This might be the ‘Raging Wave’ of the seas come inland. His name derives from Tigernonos ‘Great Lord’ and he is placed as counterpart to the ‘Great Queen’ Rigantona (Rhiannon). There is no direct link in terms of names here, but the associations paint a connection between Teyrnon and Nodens, particularly when we start exploring the associations of Nodens himself and compare him to the other gods within the continental Indo-European cultures and myth. If we were to stand at the water’s edge 2000 years ago, our prayers would be addressed to Nodens, not Nudd or Lludd. We may have cast offerings of gold or tablets of lead in exchange for blessings given or asking for a foe to be struck down. We may have gone to one of his sanctuaries - whether the place was of stone and mortar at the edge of the river Severn, or perhaps at a muddy shore by the river near where we lived. Either way, it is at the water’s edge that we would stand. What we can say for sure is that whatever his qualities, his areas of influence or the relationship the people had with him, it in some way paralleled the relationship with a Roman God. 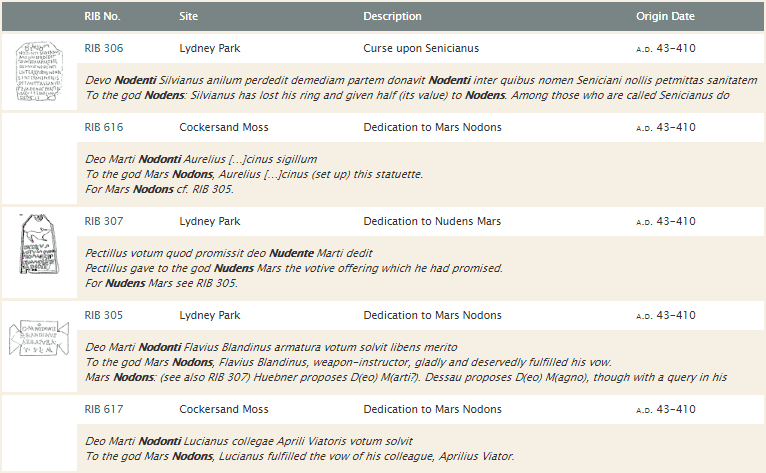 Most of the existing inscriptions to Nodens equate him with Mars. A handful of others from Britain and the continent equate him with Neptune (from Vindolanda on Hadrian's Wall we have an inscription to "No/Neptuno"), Mercury (two inscriptions from Lydney have a tentative connection) and Silvanus. It is the Mars and Neptune connections that will concern us most, though his association with Mercury and Silvanus are something I want to touch on later too Firstly Neptune; the location of the Lydney Temple above a river and the predominance of aquatic decoration only serve to reinforce the place of Nodens as a Lord of Waters. My own experience has lead me believe that he is more closely linked to fresh water; springs, streams and rivers and less the oceans. Estuaries as the place where the one meets the other are somewhere I also feel his influence. As for Mars, this puts us in mind more of the warrior as protector rather than aggressor, the warrior-king who fights to serve and protect his people rather than marauding aggressor looking for a fight. Nuada fights to defend against the Formorians, Lludd looks to defend his kingdom (with help from his more magically minded brother). Mars also had associations with healing, something we see reflected in the Lydney temple whether it is in regards to offerings and petitions left there or the association with dogs (linked not only to death and the transition to death, but also to healing) at the temple complex. We also know that the Lydney temple was probably something of an oracular site; where pilgrims would come to dream and have their interpretations read by the temple attendants. Lastly, Mars was originally a more agricultural inclined god; being the one who guarded and created the right conditions for good growth of the crops. These links to the people-working the land roles are also echoed in Nodens connection to Silvanus. What has started to stand out to me is how Nodens, and his ‘descendant’ Nudd, bears a lot of similar but subtly different characters that put me in mind of Gwyn. The oracular dream sanctuary finds echoes in the 14thC ‘evocation’ to Gwyn when soothsayers wanted to enter woodlands, the association with dogs and hounds echoes the hound and wolf connections to Gwyn. Mercury was a psychopomp, Silvanus a god of the borders between the cultivated and the wild, for Nodens to be linked with these Roman gods, there must have been something of him that that the Romans saw reflected in their own. And yet these aspects are what we tend to now associate and link to Gwyn, the ‘son’ of Nodens. ​I wonder if perhaps the father-son relationship came later and they were in fact something akin to regional variations of the same god. In time, they didn't become conflated but their roles divided between them and some form of link - in this case familial - was held on to. That asterisk stands out in the title. It is a philological notation to denote when a word, or in this case a name, is reconstructed. It means the word is not known from engravings or written sources, but that it is a theoretical word derived from the careful following of a breadcrumb trail back through language and time. It is a similar trail of breadcrumbs we have been following to discover who lies behind Lludd, Nudd and Nodens. To go back further than Nodens of the Iron and Romano-British periods, is to find scraps scattered across time, geography and culture. Jan Puhvel and George Dumezil are accessible sources to go to when looking at this period and finding relevant information on the god we are seeking. All of what we find comes from outside the British Isles and for our purposes must be inferred from the patterns and themes of the past in sister and cousin cultures. In Indo-European cultures there were two brothers; Gods. One was a God-King, who rules the heavens and the daytime. The other a God-Magician who rules the night and underworld. One was associated with order, justice and the proper running of things. The other, with disorder, chaos in the sense of cleaning and clearing away the deadwood. One could be said to be of the living, the other of the dead. These themes tended to stay rigid in that one took God-King, daytime, order and the living. The other God-Magician took the dead, the night and the underworld. This theme gets jumbled when you move to Western Europe of the Germanic and Celtic peoples. You have the pairing of Odin and Tyr for instance where the roles have been merged largely into Odin; God Magician and King, the heavens, the dead. And the role of Tyr have become diminished somewhat. In Tyr we also find the silver hand - whether this is cognate with Nuada and Llud of the Silver Hand for direct reasons I am not sure, but it is a nice synchronicity. In Britain, the roles are also slightly mixed; we have Lugus (Lug, Lleu and Lleufelys) the God-Magician but who has moved to the heavens and taken on the role of god of the people and of craftsmanship. In this case it is Nudd-Nodens who has become god of the dead and underworld (and waters), but still retained his roles of God-King; proper rulership and justice. My feeling on this is that his place is to ensure order by having a period where the old and used out is cleared away, a purge to begin again as it were, led by his son, Gwyn ap Nudd, during the new year period. As I write much of this, I am 7 days into a 12 day trip from Cambridge to London on the rivers and canals of Eastern England. I am cruising a narrowboat which will become my home in a couple of months’ time. I have over the past week seen wildlife I have never seen before and witnessed things that have struck me as more profound than I have ever considered. 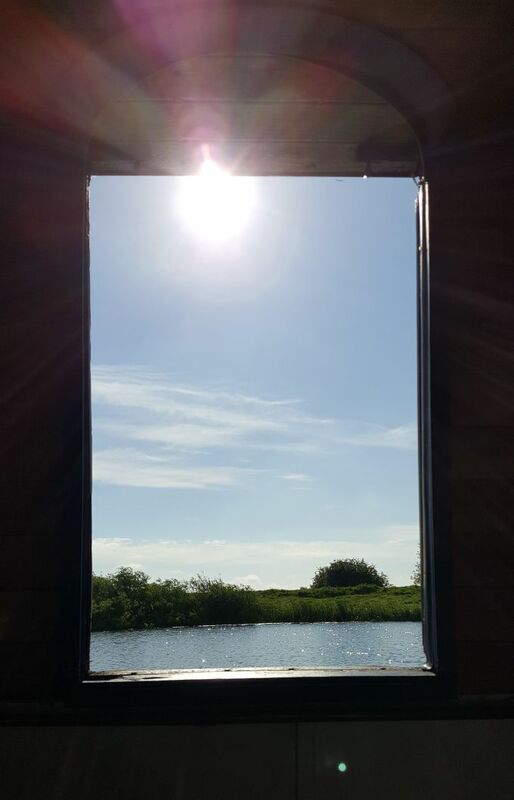 My life at the moment is completely tied to the waters; from gently flowing rivers to the vast man-made drainage canals of the Cambridgeshire fens. I am watching millions of mayfly emerge, take wing, mate and die around me. Other small invertebrates are taking to the wings and each egg they lay as they dip to the surface causes a small ripple. There are more ripples than the torrential rain of 3 days ago. This cloud of life is being fed on by fish from below and birds from above. This is the productivity of the waters brought to the surface. The fecundity of the land is something we celebrate every year, but the fecundity of the waters are ignored. This is something I am going to have to rectify at some point and in some way. A few days ago I was at the Denver and Salter’s Lode locks. These mark the crossroads where the freshwater Great Ouse meets its tidal sister and where the tidal Great Ouse meets the Middle Levels of the Cambridgeshire Fens. There were information boards giving the 300 year history of people trying to regain this land from the sea, and then trying – and regularly failing – to retain the land. It is hard not to be impressed by the tenacity, ingenuity and engineering that went into this. Though for all of this, the waters regularly drowned the landscape, and will eventually reclaim this land. What currently lie as fields and villages will once again become sunken lands. On my journey I slipped easily in ritual behaviour. Plucking a strip of willow twig soon after setting off from Cambridge and keeping it on the deck beside me. When the River Cam became the great Ouse, I cast the sprig into the water and thanked the Cam spirit before taking up another sprig from a willow as I passed beneath it. This carried on; carrying willow from river to river; casting it in and thanking the spirit of the river I had traversed. When I finally met the man-made canal network, I poured in beer and offered up a clay fish I had made specially to be given up to Nodens. I nearly wrote ‘I sank easily in ritual behaviour’ a moment ago, but that has implication of rising and sinking and suggests a ranked, qualified distinction. Slide works better, it is more accurate. Away from people for days at a time, living on my own on a boat on the water for near on 24 hours a day, my world became me, the river and the other living things I shared it with. It became difficult to get back into the real world when I arrived back in London; like heaving yourself out of a swimming pool; suddenly struck by the extra weight the waters had been supporting. I remember what it was like for that time on the water and in the sun – and now being alongside waters makes me feel lighter, makes me feel like I could cast something off if I just took a few more steps into them. The final thing that has stayed with me since coming back onto dry land is the Lady of the Lake. She strikes me as encapsulating Nodens; the sword offered from the waters to the Right person, the Proper person and ultimately taking that same sword back into themselves when his time had come. She, in her role, fits nicely for what I have come to think and feel about Nodens. George Dumezil. Mitra-Varuna: Essay on Two Indo-European Representations of Sovereignty. Trans. Derek Coltman. 1988. Jaan Puhvel. Comparative Mythology. 1989.